St. Francis de Sales School, Lenni, Delaware County. 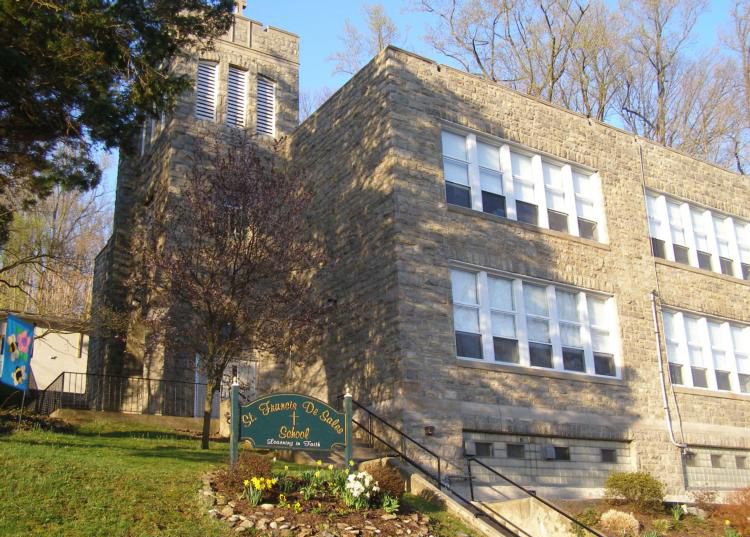 St. Francis de Sales Parish in Lenni, Delaware County, told its school families and faculty on Saturday, March 5 that the parish school will close after the current term this June. With enrollment down to 124 students — projected to drop to 118 for 2016-1017 — and educational costs climbing, the parish faced a daunting prospect in order to balance the school’s budget for next year. Tuition would have to rise another $2,000 on top of the current rate of $3,640 for in-parish students, and the discount for multiple students within a family would be eliminated. At the same time, the parish would need to provide a $160,000 subsidy. The pattern has become too familiar in recent years among traditional, neighborhood Catholic schools. As enrollment in the parish school declines, the per-pupil cost to the parish rises — less revenue from tuition is available to offset costs such as teacher salaries, insurance, school utilities and maintenance. A parish’s pastor and finance council face tough choices: raise tuition to close the gap, resulting in lower enrollment and perpetuating the cycle; raise the parish subsidy to the school in hopes that enrollment will recover but risk draining the parish’s coffers and threatening its future; or close the school and encourage parishioners to send their children to a neighboring school, perhaps with a small supporting subsidy from their parish. St. Francis Parish chose the latter option, but its transition plan offers more tuition support to students than is the norm for other parishes in a similar circumstance, according to archdiocesan officials. At that time, at the urging of the Blue Ribbon Commission on Catholic Education, regional Catholic school advisory boards began to emerge as a way to provide professional expertise and support to the Catholic schools in a given county of the archdiocese. Today six regional boards develop ways to sustain and grow Catholic school enrollment. Along with the archdiocesan Office of Catholic Education, the Delaware County Advisory Council worked with St. Francis de Sales’ pastor, Father Alan Okon, and other parishes in the area on the transition plan. The primary option for St. Francis de Sales’ students will be to attend Holy Family Regional Catholic School located 2.7 miles away in Aston. As an incentive, that school will offer St. Francis’ students a $1,000 tuition credit next year. Three other nearby Catholic school options for St. Francis’ students include St. Thomas the Apostle Parish School in Glen Mills (2.1 miles away), Mother of Providence Regional School in Wallingford (7.4 miles) and St. Cornelius Parish School in Chadds Ford (8.2 miles). St. Francis de Sales Parish will also offer $1,000 for each student attending any of the Catholic schools in the transition plan. Families must discuss their decision for school enrollment next year with Father Okon by June 1.